The Blade of leaping Gold- this costs most of a Prince’s magic item allowance and gives mediocre performance.Â Averaging across all the examples it is only about as good as the sword of might at a 1/4 of the price. Extra attacks just don’t cut it when your hero is only strength 4. Why ever take this? Sword of Hoeth- again, hideously expensive and not that great against anything with an armour save. If you want to be effective against high toughness monsters, Foe bane is nearly as “good” and less than half the price. Foe bane- ineffective against armour, useless against most rank and file. Good against large monsters with high toughness and no armour- but this is seriously limiting the options for your general.Â Sword of might is better against everyone else and cheaper too. Sword of striking- +1 to hit is worse than +1 attack for both noble and prince unless the opponent has greater or equal WS. As their WS is so high,Â this really means enemy heroes/lords who will have a good armour save. The Sword of Battle is better and cheaper and the sword of might is much better all round. Sword of battle- the sword of Might is better in every test and cheaper. Biting blade- the only things going for it are it is magical, cheap and still allows you to carry a shield. Not a great recommendation. Many of the mundane weapons give better performance- always strikes first makes great weapons great. Blade of sea gold- ignoring armour saves is just great, particularly against heroes. The weapon is good against everything apart from from large monsters. 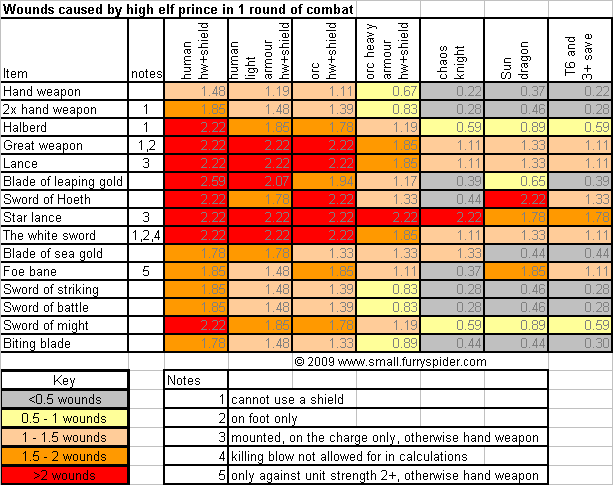 It is particularly useful when you consider that most of the high elf army is poor against heavy armour. The white sword- effectively a great weapon with killing blow. If you combine it with the talisman of Loec, see enemy lords and heroes tremble (and this can be taken by a noble). If you are on foot, this is quite good really . Star lance- S7 and ignore armour saves, fantastic. Only working for the round you charge, less good. Requires careful use, but very effective providing you can break your target on the charge. Sword of Might- cheap and effective, what more need be said? Good on champions or nobles, or even a dragon mage. This really makes a lot of the other weapons look bad as it is so cost effective. Halberd/Great weapon/lance with amulet of light- magical attacks and great effectiveness plus the mount/unit gains the benefits too.